The temporomandibular joint connects the lower jaw, called the mandible, to the bone at the side of the head–the temporal bone. You can locate this joint if you place your fingers just in front of your ears and open your mouth. Because these joints are flexible, the jaw can move smoothly up and down and side to side, enabling you to talk, chew and yawn. Muscles attached to and surrounding the jaw joint control its position and movement. Some individuals develop problems associated with their temporomandibular joint (TMJ). Individuals who grind or clench their teeth during sleep may wake up from sleep with a stiff jaw or have sensitivity to cold drinks. Teeth grinding can be caused by stress and anxiety. Grinding of the teeth is a medical condition called bruxism. Bruxism is a common cause of TMJ problems. In addition, over time, the bruxism will result in the wearing down of your natural tooth enamel. In fact, those who grind and clench their teeth experience up to 80 times the normal wear per day compared to those who do not. 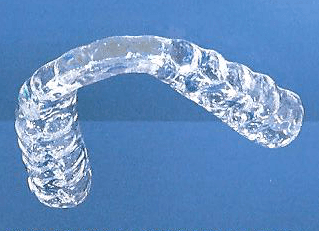 A night guard can be used to relieve TMJ associated pain and reduce the risk of wear and tear on your existing healthy teeth.The night guard is a clear, thin, removable device that is custom made to fit over your upper or lower teeth and worn while you sleep. In addition to relieving head, neck, jaw joint and shoulder pain, it will protect your existing teeth and your dental restorations. It is highly recommended for those who have crowns, bridges, implants and dentures, to offset the effects of this often-subconscious habit that occurs during sleep.